When I saw the new Warden I knew I just had to have one. Just picked it from the post office along with Codex and a set of relay pipes. 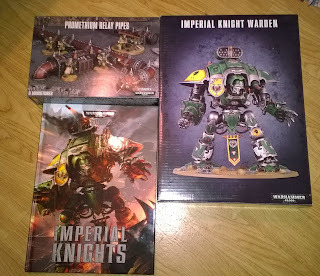 Instead Im going to focus on my Knights, Skitarii and Cult Mechanicus armies. And I also have to build few more units for my Sons of Horus army and it still needs to be painted too! Todays new releases from FW didnt help at all with my efforts to get something done! Ultramarine army wasnt one I ever thought I would build or collect but I just cant help myself. The HH stuff from FW is just so damn nice!